Raj Singh at Victoria Park. The long wait is over. Raj Singh is finally the man in power at Hartlepool United. But what next for Pools? Despite being out of the woods financially, the club is still a mess on and off the park, as proven by a week to forget when they lost to two sides in the relegation zone on home turf. Singh and Director of Football Craig Hignett have a massive job on their hands to turn the club into a force in the National League, as well as doing so while balancing the books. Here we take a look at three big decisions facing Singh & Co between now and the end of the season. It’s a simple one really. Should Pools stick with Matthew Bates, giving him the job on a permanent basis, or bring their own man in? Well, he has definitely made them make a decision. No one could have predicted that Pools would have such a dramatic turnaround in fortunes under untried and untested Bates. 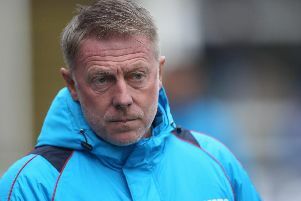 But of late they’ve faltered and it might be the case that Singh and Hignett was to freshen things up with a manager who can grow with the football club. A number of names have been mentioned in recent weeks, with former Darlington manager Martin Gray rumoured to have been sounded out for the role. Blyth Spartans’ Alun Armstrong, as well as Spennymoor Town’s Jason Ainslie are two others who are admired by the Pools hierarchy. At this stage the smart money is on a new manager, probably at the end of the current campaign. But in Bates’ favour is that the players want him to get the job. They’ve really responded to his methods, and in particular, the coaches he has brought to the table in Ged McNamee and Ross Turnbull. Chief executive to remain or be shifted on? Singh is a massive fan of the work Pam Duxbury has done to keep Pools’ head above water. As a result, he is keen to give her a chance to continue her work at Victoria Park. She knows the workings of the club inside out, and at this stage he is keen not to rock the boat too much. Continuity, in the club’s hour or need, with so much change happening off the park, is key for Singh. Singh has not actually ruled Duxbury out for a longer stay at Pools, even beyond the summer. After some damaging criticism and tiring work it remains to be seen whether there is the desire to see things out from Duxbury’s perspective. Again this is a one, where if I was a betting man, I think Duxbury will be heading out the exitdoor. But it could be another one which is not done until the end of the current campaign, which closes up in just three weeks. Only time will tell. New owner Singh has made it very clear he is keen to appoint a football board at Pools. This will not be made up of old pals or business partners. No, this will be specifically appointed football people, with links to the area, and if possible Hartlepool United. Singh admits he made errors at Darlington, where he was previously owner, too. What he had there was no barrier between the first-team coaches and himself. He made all of the decisions above that off the team boss. He knows he made bad calls, with the best intentions. At Pools he does not want history repeating itself. As a result the coming weeks will see a board drawn up and appointed. It will be interesting to see who gets the call.